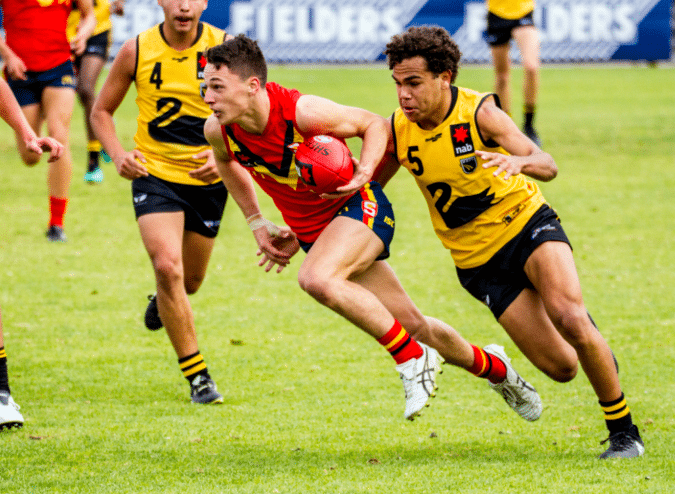 WESTERN Australia and South Australia have dominated the 2018 AFL Under-16 All Australian side, with almost half of the representatives from those states. The two states accounted for both the Victorian teams at the recent National Under 16 Championships, and played out a thriller last month which saw South Australia win by just three points. 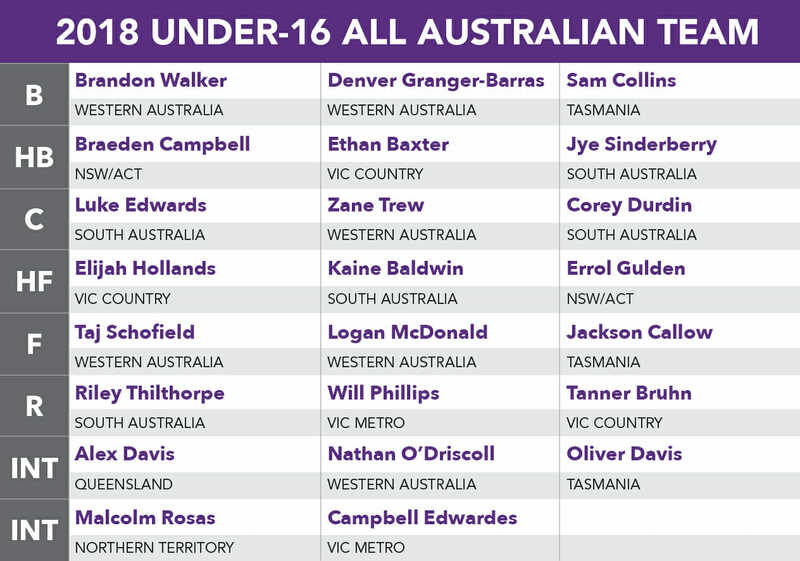 Western Australia has the most with six players, including defensive duo Brandon Walker and Denver Granger-Barras, while forwards Logan McDonald and Taj Schofield have made the team. Zane Trew will control the midfield, while Nathan O’Driscoll has been named on the five-man interchange. South Australia has the five members in the team, including midfielders, potential father-son prospect Luke Edwards, and Kevin Sheehan Medallist and South Australian Most Valuable Player (MVP) award winner Corey Durdin. Jye Sinderberry has been named at half-back, while Kaine Baldwin (centre half-forward) and Riley Thilthorpe (ruck) hold up key positions. Vic Country has three players in the team with centre half-back Ethan Baxter, half-forward Elijah Hollands, and MVP winning midfielder Tanner Bruhn named in the final 23. Their Victorian Metro counterparts have just two players in the team – MVP winner Will Phillips, and Campbell Edwardes. Remarkably, Tasmania has recorded more members than Vic Metro in the final 22, as Sam Collins, Jackson Callow and Oliver Davis have been named in the side. The final four spots belong to other Division Two states, with NSW/ACT pair Braedyn Campbell (half-back) and Errol Gulden (half-forward) representing the Rams. Queensland’s Alex Davies and Northern Territory’s Malcolm Rosas were named on the interchange. 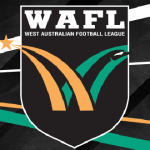 Division One title-winning coach Julian Farkas from South Australia was named as head coach of the side, with Tasmania’s triumphant Division Two title-winning coach Nathan Warren named as assistant coach. 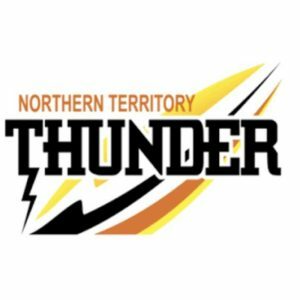 SOUTH Australia has done the double at the 2018 National Championships, claiming the Under 16s title to go with their Under 18s victory a week earlier. The Croweaters defeated Vic Metro by 12 points to remain undefeated and claim the title on the final day of the championships last Friday. South Australia came from behind in the opening round to post a narrow three-point victory over Western Australia, before easily accounting for Vic Country last Monday, and defeating Metro four days later. South Australian vice-captain Corey Durdin was awarded the Kevin Sheehan Medal for the top player across Division One, while also being named South Australia’s Most Valuable Player (MVP). Second placed Western Australia – who came within a kick of the overall title – defeated both Vic Metro and Vic Country comfortably in Queensland last week and announced David Yaccob as their MVP. Oakleigh Chargers’ Will Phillips‘ was named Vic Metro’s top player across the carnival with the Metro side having just the one win over Vic Country. For Country, Geelong Falcons’ Tanner Bruhn was the standout performer across the three games and named as MVP. Among the top performers outside the MVPs were South Australia’s Kaine Baldwin – who booted four goals against Western Australia in a best on ground effort, and another goal in each of the other two games. Other Croweaters who impressed across the carnival were Riley Thilthorpe and Henry Nelligan, named in the best multiple times. For the Black Swans, Brandon Walker, Taj Schofield and Logan McDonald were among the best, with McDonald being the dominant goal kicker up forward across the carnival, with nine majors. For the Victorian sides, Calder Cannons’ Campbell Edwardes, Northern Knights’ Ben Major and Western Jets’ Cody Raak were the top performers for Vic Metro, while Bendigo Pioneers’ and Country captain Sam Conforti and exciting GWV Rebels’ forward Jamarra Ugle-Hagan were named among Vic Country’s top players as the latter booted four goals across the matches. Vic Metro: Failli 3, Bowey 2, Jenkins 2, Varagiannis, Laurie, Phillips, Raak, Hart. Vic Country: Ugle-Hagan 3, Fitzpatrick 3, Conforti 2, Hollands 2, Stevens. South Australia: Baldwin 4, Dudley 2, Schwerdt 2, Dumesny, Horsnell, Wright. Western Australia: McDonald 3, Allen 2, Bellchambers, Curley, Evans-Thomson, Western. South Australia: Dudley 3, Higgins, Dean, Dumesny, Baldwin, Thilthorpe. Vic Country: Gadsby, Braver, Reid. Western Australia: McDonald, George, Allen, Cartwright, Daly, Jetta, Trew, Walker. Western Australia: Dann 4, Avery 2, Cartwright 2, Western 2, Walker, Allen, Daly. Vic Country: Neal 2, Ugle-Hagan, Gay, Hollands. South Australia: Dudley 3, Horsnell 3, Dumesny 2, Durdin, Dean, Higgins, Pedlar, Baldwin. Vic Metro: Phillips 2, Edwardes 2, Tucker 2, Failli, Bowey, Jenkins, Teal, Feagaimalii. A GOAL in the dying seconds to Cooper Horsnell has helped South Australia to an opening round win in the National Under 16 Championships. With the final two rounds to be played on the Gold Coast on July 9 and July 13, South Australia claimed a vital win over a very competitive Western Australia side by just three points. The Black Swans led by four points at quarter time, but a four goals to two second term saw the Croweaters hit the front by seven as they headed into the main break. Both teams capitalised on their opportunities in the third term, booting three goals apiece, before a final quarter thriller saw the home side just scrape home. Western Australia hit the front with a Lewis Evans-Thomson goal in what was a thrilling opening eight minutes which saw the Black Swans boot two majors and South Australia boot one. The Black Swans will rue missed opportunities in the final stanza, kicking a number of behinds before Horsnell split the middle and gave South Australia a crucial two-point lead. From there, the Croweaters held on for the 11.3 (69) to 9.12 (66) victory, despite having seven less scoring shots. 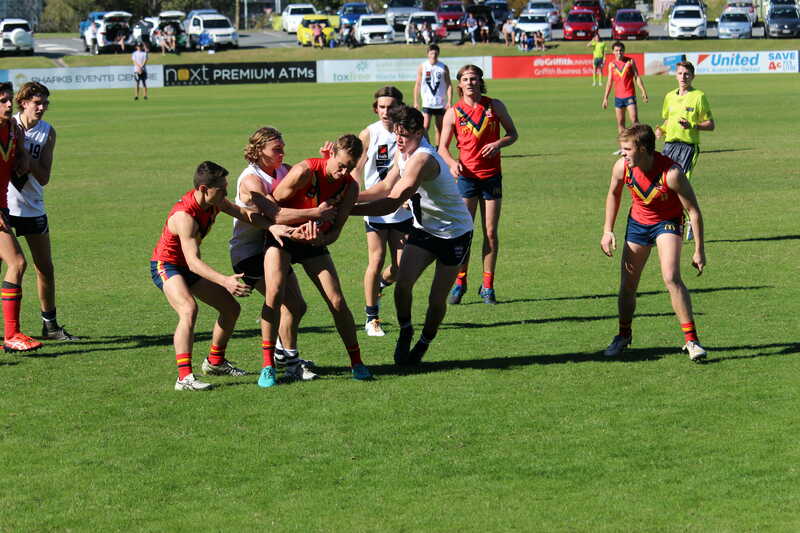 South Australian captain Kaine Baldwin was dominant up front, booting four majors, while Isiah Dudley and Ethan Schwerdt were dangerous at his feet, booting two majors. Corey Durdin was the standout player on the ground, amassing a game-high 23 disposals, five marks, seven tackles, four clearances and eight rebounds for the home side, while Riley Thilthorpe showed great ground coverage, playing through the ruck to record 30 hitouts, but have a Brodie Grundy-like game with 17 touches, eight marks and four tackles to go with it. Henry Nelligan assisted Durdin through the middle with 19 disposals, three marks and seven clearances to be a threat on the inside. For Western Australia, tall forward Logan McDonald booted three goals, while fellow key position player Jack Allen finished the game with two majors. Ira Jetta was among Western Australia’s best with 19 disposals, two marks, four clearances, four inside 50s and eight tackles, while David Yaccob was deemed the Black Swans’ best with 15 disposals, three marks, four inside 50s and two rebounds. Full-back Denver Grainger-Barras had almost one-third of his team’s rebounds, racking up seven from his 13 disposals and three marks. Brandon Walker (17 disposals, two marks and three rebounds) was used effectively off half-back, while Zane Trew (16 disposals and five clearances) and Taj Schofield (14 disposals and 10 tackles) were other top players for the visitors. South Australia go on to face the other winner in Vic Metro, while Western Australia will look to bounce back with a victory against Vic Country. Both games will be played at Southport on July 9. The final round of action will see South Australia take on Vic Country and Vic Metro face Western Australia, which is played at the GABBA on July 13. For more specific information on South Australia’s victory, head to the game wrap by Zac Milbank on the SANFL website. South Australia: Baldwin 4, Schwerdt, Dudley 2, Wright, Dumesny, Horsnell. Western Australia: McDonald 3, Allen 2, Western, Curley, Bellchambers, Evans-Thomson. South Australia: Durdin, Nelligan, Baldwin, Thilthorpe, Roberts, Schwerdt. Western Australia: Yaccob, Grainger-Barras, Walker, Trew, Schofield, Jetta. Meanwhile at Ikon Park, Vic Metro came from behind to record a memorable eight-point win on Saturday. Vic Country booted five goals to three in the first term, then extended its advantage to 27 points at the main break. Metro made serious inroads in the third quarter, piling on four goals to one to cut the deficit to six points by the final break, then finished the game off strong with another four-goal quarter, while restricting its opponents to two goals, in order to win 12.9 (81) to 11.7 (73). Western Jets’ Lucas Failli was the key up forward with three majors for the winning side and was a clear standout up the attacking end. Oakleigh Chargers’ Lochlan Jenkins and Sandringham Dragons’ Jake Bowey were also able to hit the scoreboard with multiple goals, the latter of which was also named among the best. Northern Knights’ Ben Major was deemed the top Metro player on the day, named among the best with Oakleigh Chargers’ Will Phillips (one goal), Sandringham Dragons’ Darby Hipwell and Eastern Ranges’ Connor Downie. The Metro victory was a crucial one, ahead of its clash with South Australia at Southport on July 9. For Vic Country, talented forward Jamarra Ugle-Hagan was a live-wire up the attacking end, booting three goals and looking creative and dangerous. Gippsland Power’s Thomas Fitzpatrick also booted three majors, while Bendigo Pioneers’ Sam Conforti and Murray Bushrangers’ forward Elijah Hollands booted two in a strong offensive effort by the Country side. GWV Rebels’ Nick Stevens was named as Country’s best, booting a goal and combining well between midfield and half-forward. 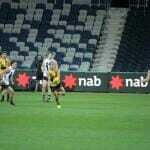 Hollands, Ugle-Hagan and Murray Bushrangers’ full-back Ethan Baxter were also impressive, as were Geelong Falcons’ pair midfielder Charlie Lazzaro and half-back Tanner Bruhn.